1880s autograph album that appears to have belonged to Elizabeth A. (Hanson) Hart, "Lizzie", of Gonic, New Hampshire, which appears to have been compiled both before and after her marriage to Roscoe L. Hart, and includes a few later entries from each of her three children. Gonic is a neighborhood in the City of Rochester, New Hampshire. The album is missing a few pages at the front; accordingly, there's no ownership page or title page. But the fact that the three Hart children signed pages near the end of the album and the fact that signer Sadie L. Hanson of Rochester, New Hampshire, indicated she was Lizzie's cousin all point toward Lizzie as the album owner. Villa Estes of Springfield, Maine, signed on "6-3-1883"
Elizabeth A. Hanson, "Lizzie", was born about June 1865 at Dover, New Hampshire, the daughter of John W. and Martha A. (Bickford) Hanson. 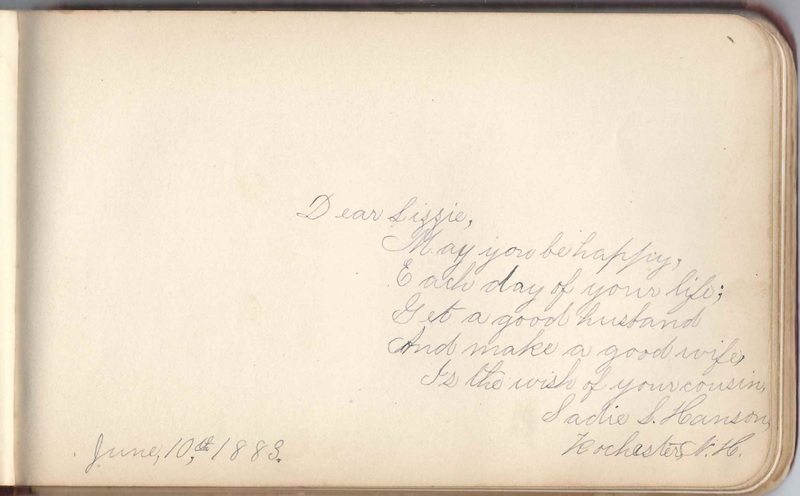 There's a page in the album signed by M. A. Bickford of Rochester, New Hampshire, on June 10, 1883, and it's tempting to think that the signer might have been Lizzie's mother, Martha A. (Bickford) Hanson. The only signer who expressed a relationship with Lizzie was the aforementioned Sadie L. Hanson of Rochester, New Hampshire, who signed her page on June 10, 1883. There were other signers named Hanson and Bickford; refer to the list below. On 30 June, 1884, Lizzie married Roscoe L. Hart, son of Daniel and Ella Vienna (Ricker) Hart. I'm not sure of Roscoe's mother's given name as it appears in several forms on records. And there's an equal number of varying middle initials for Daniel. Roscoe was born 29 October 1861 at Milton, New Hampshire. Roscoe and Lizzie would have three children, two sons and a daughter. 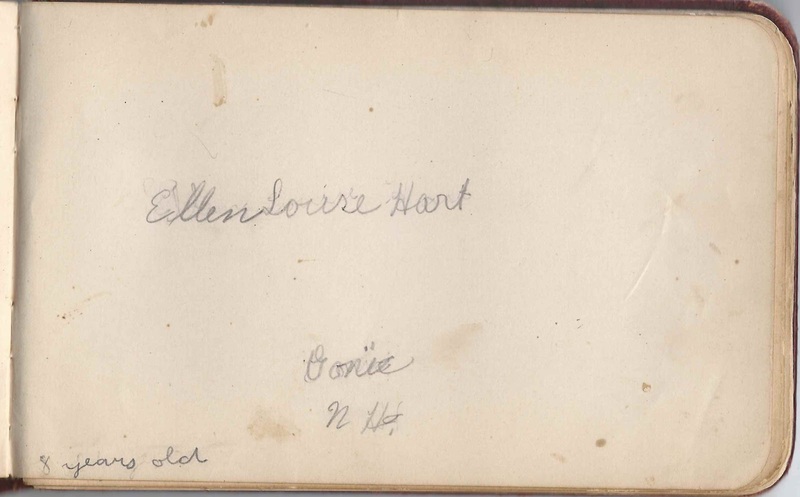 Daughter Ellen Louise Hart of Gonic, New Hampshire, was the first of the siblings, in page order, to sign a page, when she was eight years old, presumably about 1905. Ellen Louise Hart was born 7 June 1897 at Gonic, New Hampshire. 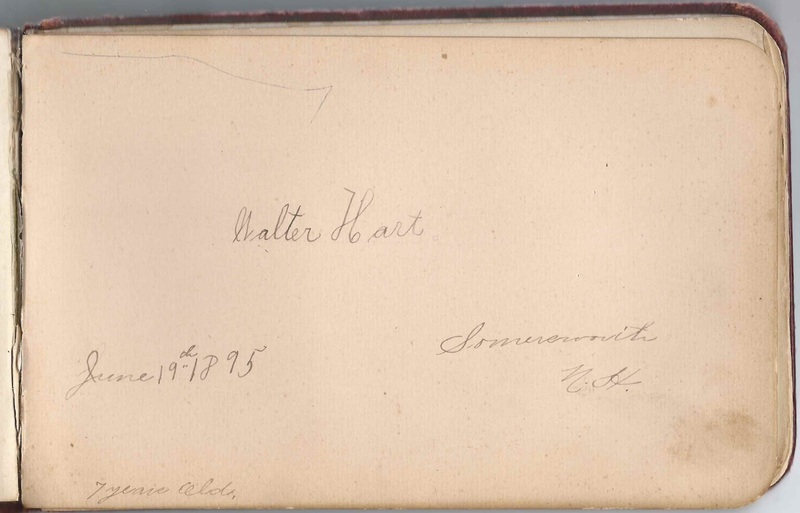 Next in page order was son Walter Hart, who signed his page on June 19, 1895 at Somersworth, New Hampshire, and was likely the Walter E. Hart who signed a page near the end of the album, with the address 8 Ackerson Street, Dover, New Hampshire. He was Walter Ernest Hart, born 3 September 1887 at Rochester, New Hampshire. 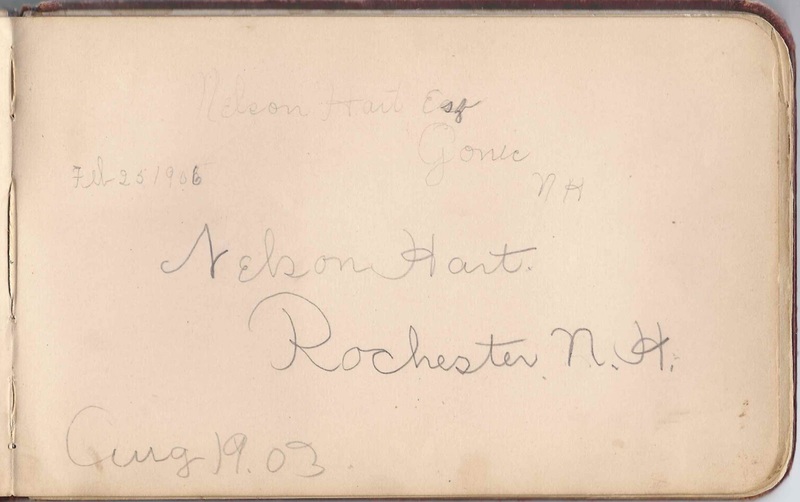 In between the two pages signed by Walter was a page signed by son Nelson Hart of Rochester, New Hampshire, who signed the page twice, once on August 19, 1903 and again on February 25, 1906. He was Nelson Roscoe Hart, born 27 July 1890 at Gonic, New Hampshire. Lizzie's husband Roscoe L. Hart died in 1903. Lizzie lived at least through the enumeration of the 1930 Census of Rochester, New Hampshire, and had not remarried. Very faint, but might be Lillie H. Rust of Moultonborough [if Moultonborough, is correct, then it would be New Hampshire], but I'm not sure of any of those components. Surname could be Hurst [there's another signer by that name] or Hart [signers by that name]. I believe the page was signed in 1885. Ethel F. Bickford of Somersworth, New Hampshire, signed on September 16, 1895. Presumably Ethel Florence Bickford, born 26 February 1876 at Somersworth, New Hampshire, daughter of Jonathan and Fannie (Tibbets) Bickford. Villa Estes of Springfield, Maine, signed on "6-3-1883" at Gonic, New Hampshire. She was Villa W. Estes, also known as Rexaville Estes, daughter of David and Emily N. (Ward) Estes. Villa would marry Charles A. Nute at Lincoln, Maine, on 16 November 1884. Hannah R. Farrington of Andover, Maine, signed at Gonic, New Hampshire, on June 3, 1883. Mrs. Leslie Furber of Rochester, New Hampshire. She was Mrs. Annie Furber; her husband signed the left facing page. 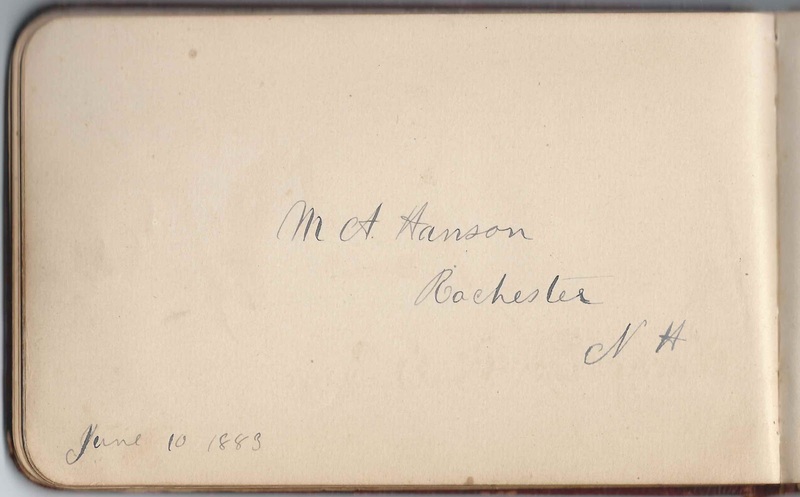 M. A. Hanson of Rochester, New Hampshire, signed on June 10, 1883. It's tempting to think that this signer might have been Lizzie's mother Martha A. (Bickford) Hanson. Sadie L. Hanson of Rochester, New Hampshire, signed on June 10, 1883; Lizzie's cousin. Middle initial might be S but it looks different from the S in Sadie. Walter Hart, signed at Somersworth, New Hampshire, on June 19, 1895; "7 years old". Walter Ernest Hart was born 3 September 1887 at Rochester, New Hampshire, son of Roscoe and Elizabeth (Hanson) Hart. He was the son of album owner Elizabeth (Hanson) Hart. Nelson Hart of Rochester, New Hampshire, signed in August 1903. He signed later at Gonic, New Hampshire, on February 25, 1906. Nelson Roscoe Hart was born about 27 July 1890 at Gonic, New Hampshire, son of Roscoe Hart and Elizabeth (Hanson) Hart. His mother was the album owner. 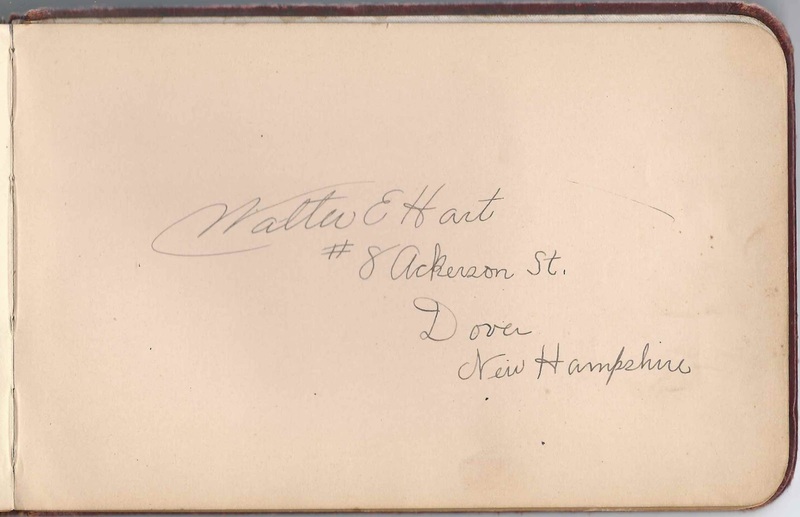 Walter E. Hart of #8 Ackerson Street, Dover, New Hampshire, presumably the Walter who signed another page in the album, son of Roscoe and Elizabeth (Hanson) Hart. 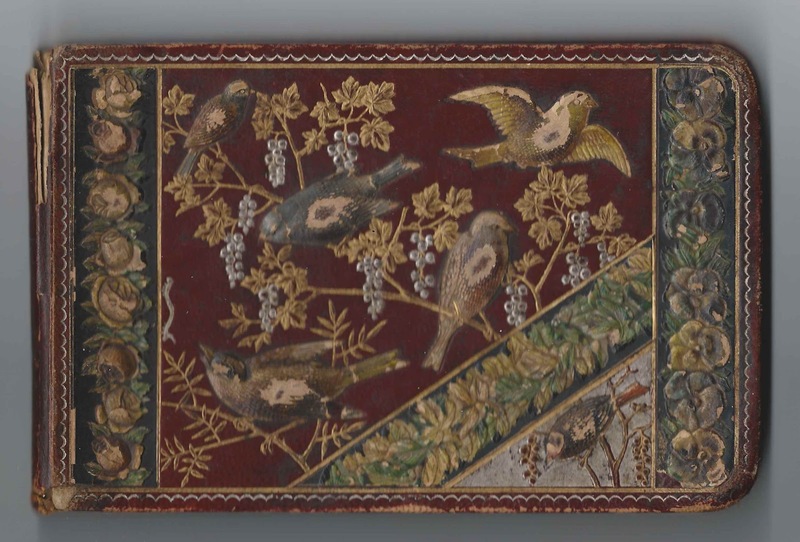 C. Hurst, signed at Gonic, New Hampshire, on January 14, 1883. Middle initial might be M.
Clara M. Marshall of Bangor, Maine, signed at Gonic, New Hampshire on June 10, 1883. Perhaps the Clara Marshall Varney, who died at Rochester, New Hampshire, in 1943, wife of Nehemiah Varney. That Clara was born at Springfield, Maine, about 1852, daughter of John/Jonathan and Evelyn (Watson) Marshall. Julia E. Meade of Gonic, New Hampshire, signed on "1-12-1883"
Rilla J. Paige of North Waterford, Maine, signed at Gonic, New Hampshire, on December 26, 1882.